In the first of a new series about the many cyclists writing about their experiences and opinions, we meet Donna Navarro whose wide-ranging blog covers topics as diverse as t-shirts and clipless pedals at Ordinary Cycling Girl. Tell us a little about what Ordinary Cycling Girl is and what it covers? 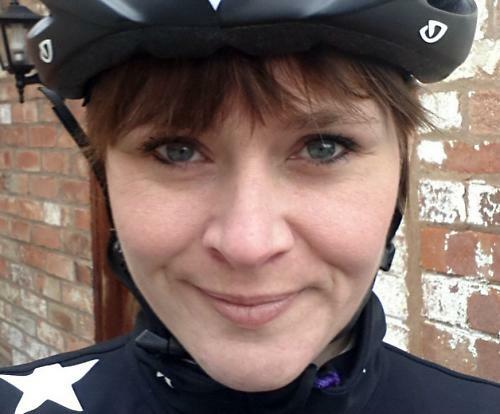 Ordinary Cycling Girl is a personal blog from me, a mid thirties married mum of two; an ordinary girl discovering and loving life on two wheels. It covers the ups and downs of my own two-wheeled adventures whilst trying to offer motivation and encouragement, and hopefully some inspiration and empowerment to others who are starting back on their own two-wheeled journey. It's primarily aimed at women, but I try to ensure there's something for everyone. Why did you start writing about cycling? I remember being filled with a real mixture of trepidation and huge enthusiasm when I first started cycling on a road bike. I have degenerative disc disease and until I discovered cycling I was unable to find a sport that I enjoyed that didn't cause me pain. Once I got on my bike and realised it didn't hurt and how much I loved the freedom, I couldn't find enough information to read; nothing I could find particularly focused on women and cycling, especially ordinary women like me, who were new to cycling and loving it! Everything I could find was aimed at the seasoned cyclist who already had lots of experience and fitness. So Ordinary Cycling Girl was born out of a desire to find something personal I felt I could truly relate to. I've been cycling for around three years now. I should be better than I am, but with two young children, like many working mums, I don't get to ride out as often as I'd like. What is your favourite cycling moment? I have a couple… conquering clip in pedals felt good. I finally felt like a 'real' cyclist after I mastered those, but my favourite moment has to be watching Laura Trott and Katie Archibald race in the Milk Race in 2014 in Nottingham. In the car on the way home, my six year old daughter declared that she was determined to learn to ride her bike the very next day. Up until that point she had been terrified of doing so. And the very next day, she did just that! And my three year old son was only a day or two behind her. They had been completely inspired. That was magical for me. What one cycling product would you never be without? I have to say my bike! I have a Specialized Dolce Sport at the moment. It's my first and only road bike to date. We've had some good times together! My husband, a really keen cyclist himself, keeps telling me it's time for an upgrade but I can't bring myself to sell her on. I know, I know, I should just add to the collection! We are very lucky to have some beautiful Nottinghamshire scenery with undulating hills and quiet country roads. You can't get much better; some days you can see for miles and miles and could be anywhere in the world. I love the freedom cycling gives and the sense of tranquillity it brings. As a mum, I really value that time on my own with my thoughts and the opportunity to really appreciate my surroundings. I did have a go at track cycling not too long ago. I was so scared of being on a fixed gear bike, clipped in and riding without traditional brakes. But it was the most exhilarating, adrenalin pumping cycling experience I've had so far. I'd love to do some more! What is your earliest cycling memory? Learning to ride a blue Raleigh bike around the streets near my house when I was about six or seven. I remember my mum running behind holding the saddle and I hadn't realised that she had let go and I was cycling on my own. What a brilliant feeling when I realised! What is your go to beverage of choice? A nice cup of tea with a bowl of porridge always go down well for a pre-ride breakfast. Good old chilled tap water for a ride, or an isotonic orange flavoured drink whilst cycling. And post ride, large glass of cold milk! When I'm not cycling and the sun's gone down, it has to be a Hendricks gin and tonic every time! Hmmm, this is a tricky one. I love cake! If I had to choose just one, I think it would have to be a banana cake! Delicious… with some element of goodness in it! But honestly, I'm not fussy! If you could ride bikes with any one person (alive or dead) who would it be and why? My daughter. She's only eight but she adores cycling and her enthusiasm is infectious. Watching her passion for cycling grow over this last year since she first learnt to ride her bike and being able to share in her cycling experience, and hopefully contribute to her enthusiasm, is the best feeling. What is your favourite cycling blog? There are so many great blogs out there now aimed at every type of cyclist. I love how the cycling blogging community has grown since I started cycling only a couple of years ago. I don't really have a favourite; I read a good few different fitness blogs on a regular basis. I was really disappointed to see Women's Cycling magazine close in Autumn last year, but I'm so pleased to see lots more blogs and sites catering specifically for women. Total Women's Cycling gets a big thumbs up from me and is always my first port of call. It has lots of empowering posts, a great deal of humour and so much I feel I can relate to. And Road.cc of course! It has such an enthusiastic and active community — I like to pop over and gauge people's opinions on the latest developments in cycling and the latest kit releases. That 'favourite cycling moment' is a lovely story. I can't bring myself to sell her on. I know, I know, I should just add to the collection! Absolutely. I can't understand why you would want to sell a bike you love and enjoy riding.